It’s that time of year when the full moon is most beautiful, and the trees dance in a cool autumn breeze, dressed in tones of coming winter. Darkness falls and zombies rise from their graves. Ghouls and ghosts roam the streets. Fear molds the imagination into an embrace of humanity’s love of being afraid. Also, candy. People love candy. Halloween has always been my favorite holiday. Ever since I was G.I. Joe back in the 80s (that’s the first costume I can remember wearing), I’ve adored the night of mischievous fun. It spawned my love for horror movies, which later grew into literature and all things one might call horrid and repulsive. By a stroke of luck I ended up living back in the neighborhood I grew up in. In this area, it’s the hotspot for trick or treating every year. People travel from nearby towns just to come to this particular collection of streets. One is lined with huge Victorian homes. There’s even a funeral home that gives out candy. As kids we used to joke that they made the candy out of the cadavers. Last year I got over 1,500 kids at my door. That’s a lot of candy to give out! But it makes the elaborate decorating outside of my house worthwhile. Last year the house across the street had a bit better display. But unless they worked some magic and had the determination of a 3rd generation horror fanatic I’m going to blow them out of the water this year. And I have even bigger plans for next year! That will top the best house in the neighborhood. And because I grew up here, took my own child trick or treating here every year, I know exactly which house that is and how good their display is. But enough maniacal babble about my Halloween pride. This year I decided to make some of my own decorations. 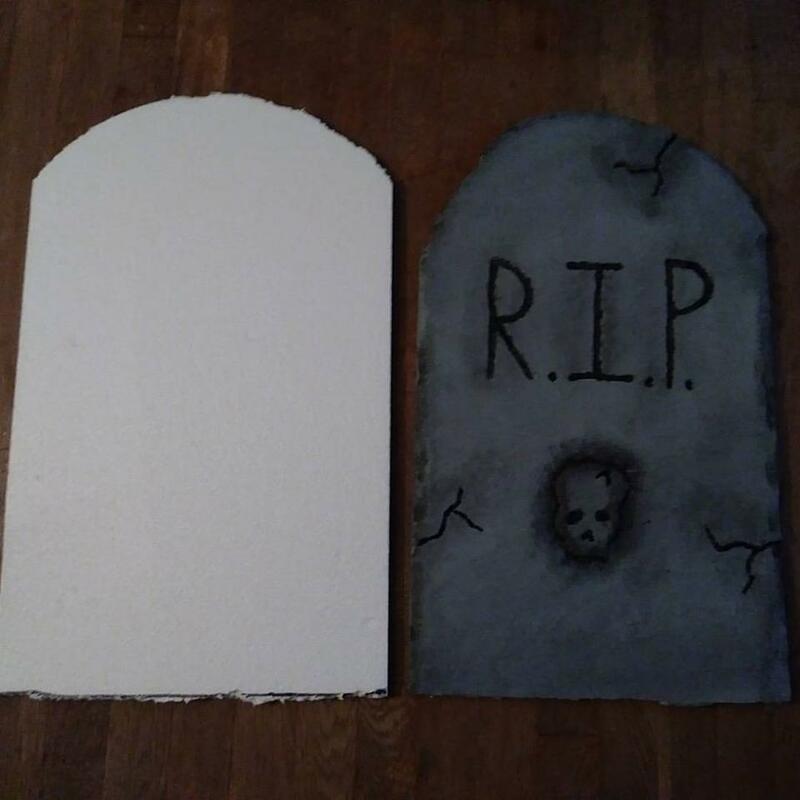 I made my own tombstones because I want to turn the entire front yard into a cemetery. The ones you can buy at the store would add up to quite a bit compared to the number I can make for the cost of materials. I just bought some cheap foam from the hardware store, gray latex paint, and black acrylic paint. I cut the foam with a hobby knife and wrote the inscription in permanent marker. Then I used the tip of a paintbrush handle and a pen to engrave the words, cracks in the stone, and the skull on the bottom. After that I painted the whole thing in gray latex outdoor paint. After letting the paint dry, I used black acrylic paint to fill in the engraved letters and designs. I then used a slightly wet kitchen sponge with black acrylic paint to add the grainy look and darken areas around the edges and engraving. To place the gravestones in the ground I’m using some one foot yard stakes I bought at a hardware store (and since I’m being Dracula for Halloween I may want to stay away from them). I hammered the stakes in the ground and used duct tape to attack the foam gravestone. It took some time to do all of this, and I plan to make as many as I can. But it’s a great solution if you want to turn your front yard into a cemetery on a budget! This idea I came up with out of nowhere. And all from stuff I already had around the house. Didn’t have to buy a thing to make these ‘Jars of Oddities’. For the red one on the left I used some plastic cement to glue the back of the skeleton’s head to the inside of the jar to keep him from floating. I filled the jar with a mixture of water and a little fake blood. I painted the lid with matte black spray paint. 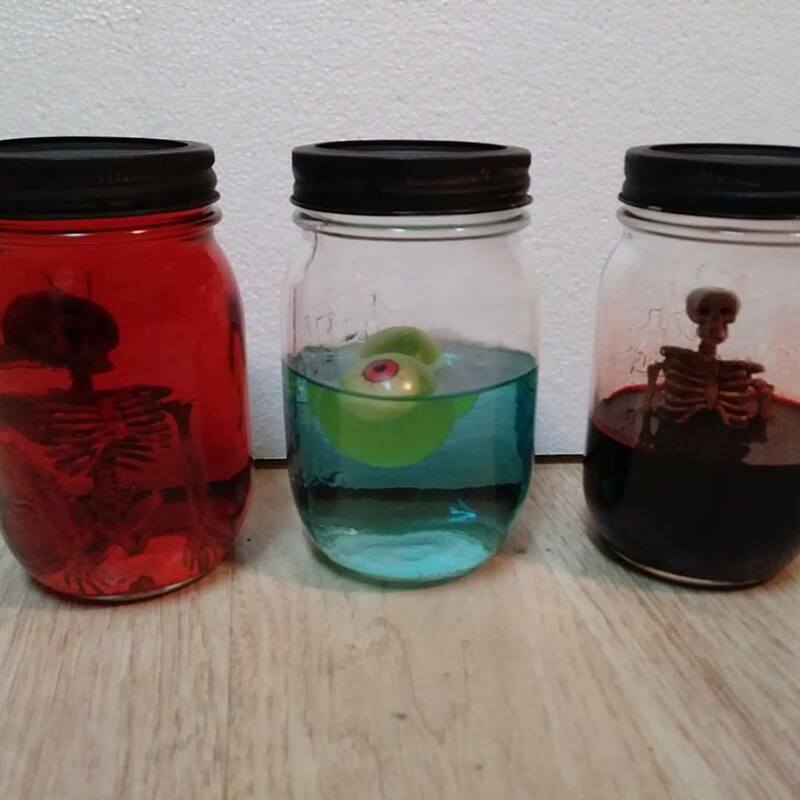 The one in the middle I used eyeballs I got at a dollar store, some food coloring, and water. For the one on the right, I followed the same steps as the first one, but put only fake blood in without any water. The skeletons were from a skeleton garland. But I had to take their legs off for them to fit. But a torso in a jar is cool so it works! I’m going to be making all sorts of Halloween themed foods as well! Including a graveyard cake, Jim Jones punch, jello brains, and lotion for the basket (vanilla pudding). Follow my blog to get an update on the next Halloween post! This entry was posted in Uncategorized and tagged all hallows' eve, gravestones, halloween, homemade decorations, jar of oddities, trick or treat by Lee Andrew Forman. Bookmark the permalink.